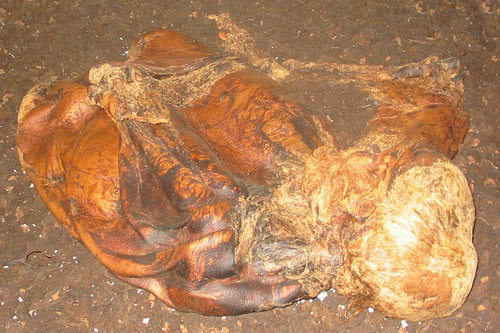 Lindow Man, the intact remains of a 25-year old gent found in a peat bog who died nearly 2,000 years ago, is leaving the British Museum to set off on his hols. Sadly for him no Balearic break or spell in a Swiss spa beckons: he's being packaged off to the Manchester Museum for a long-term loan. Mr. Lindow, as he (presumably) likes to be known, was unearthed in 1984 near Wimslow, and remains the best preserved body from the Iron Age. Kept in good nick thanks to chemicals in the bog, scientists were able to discern the poor fellow's grisly end: he was bashed round the head, his throat was slit, and he was finally garrotted, possibly as a sacrificial victim. And to top it all, his last meal wasn't some lavish buffet affair of roast oxen or the like, but a scrap of unleavened bread. Still, two millenia lingering in the peat bog have not been in vain, and our Lindow is surely enjoying a more interesting existence in death than he ever saw in life.